We’d love your help. Let us know what’s wrong with this preview of Guitar Genius by Kim Tomsic. To ask other readers questions about Guitar Genius, please sign up. Love this story about how curiosity, exploration, and gumption can lead to the best of inventions. Such great detail in this book for tinkerers and builders. Play on, Les Paul! This is an outstanding and exuberant introduction to Les Paul, his extraordinary inventiveness, musical achievements and fascinating personality. Kim Tomsic's text is wonderfully geared to a picture book audience and achieves a terrific balance of providing information (including technical descriptions), entertaining and never talking down to the readers. The book has an admiring tone which works well and highlights some of Paul's important qualities such as curiosity and perseverance. Brett Helq This is an outstanding and exuberant introduction to Les Paul, his extraordinary inventiveness, musical achievements and fascinating personality. Kim Tomsic's text is wonderfully geared to a picture book audience and achieves a terrific balance of providing information (including technical descriptions), entertaining and never talking down to the readers. The book has an admiring tone which works well and highlights some of Paul's important qualities such as curiosity and perseverance. Brett Helquist's illustrations are so inviting, colorful and fun, packed with charming humor. The illustrations take full advantage of the large format and Helquist uses bright full-page spreads as well as small technical sketches of Paul's various inventions. 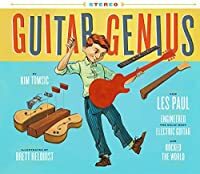 “Guitar Genius,” by @kimtosmic and illustrated by @bhelquist, is a fascinating book about the life and inventions of rock legend Les Paul. Embarrassingly, I did not know anything about Les Paul before reading this book but I learned so much! The story begins with young Les ignoring negative comments from a music teacher and making his own radio set, and follows his life focusing on his inventions culminating with his creation of the solid body electric guitar at age 26. 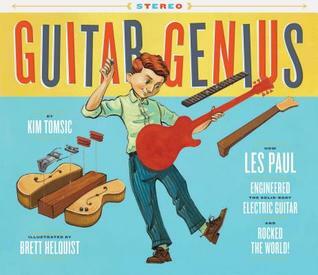 This book is for inventiv “Guitar Genius,” by @kimtosmic and illustrated by @bhelquist, is a fascinating book about the life and inventions of rock legend Les Paul. Embarrassingly, I did not know anything about Les Paul before reading this book but I learned so much! The story begins with young Les ignoring negative comments from a music teacher and making his own radio set, and follows his life focusing on his inventions culminating with his creation of the solid body electric guitar at age 26. This book is for inventive kids and music lovers. Written for ages 5-8. Look for it when it is released on June 1, 2019. Thanks to @chroniclebooks for sharing this book with #kidlitexchange and thanks to the @kidlitexchange network for the review copy of this book – all opinions are my own. A beautiful story about the power of perseverance told through one of music's greatest (and most important) inventors. Chock-full of history, Tomsic makes accuracy her mission in a very accessible way. Beautifully illustrated and utterly genius. Perfect for older littles and oldest music-lovers alike. P.S. I may be a little biased after meeting Kim this other night and spending some time gabbing, but I already loved the book before meeting her - she just provided some really wonderful into her l A beautiful story about the power of perseverance told through one of music's greatest (and most important) inventors. Chock-full of history, Tomsic makes accuracy her mission in a very accessible way. Beautifully illustrated and utterly genius. Perfect for older littles and oldest music-lovers alike. This biography of Les Paul is so special to me. Not only is it wonderfully written and full of detail, making it a great reread time and time again but it touches a special place in my heart. I am the queen of reuse. I was so inspired to learn how Les Paul reused items from coat hangers to broomsticks to transform the music industry. If the child in your life (or you for that matter) learn best by tinkering they will definitely see themselves in this story. An amazing man, and an amazing story about him. I had no idea Les Paul had invented so much that underpins modern popular music. Kim Tomsic has told an inspiring story with details that should enthrall every reader, child or adult. I can see kids dragging out bits and pieces of things to invent new gadgets after reading it. Combined with keen illustrations, this book is a real winner on all levels: story, inspiration, and art. More children's nonfiction should be like this. Wow, what an amazing story! Not only was a young Les Paul told he wasn't musical, but his music teacher even sent him home with a note telling his mom to save her money and cancelled his music lessons. Yikes! But Les Paul had a love for music and a passion to create. And his story has a happy ending-- an award-filled, musical one, too! Great read for both kids and adults. Wonderful biography written with fantastic voice and so many interesting facts. This is a book that musicians will embrace and the rest of us will learn from. A wonderful combination of illustrations and photographs help tell the story. Fascinating, fun, and inspiring for kids and adults alike! My 12-year-old guitar-obsessed son was captivated by this book... as was I! And it's got a wonderful message of perseverance! HIGHLY recommended! This was very informative! I knew a lot about Les Paul from my husband, but learned even more in this! He is such an inspiration to kids who are told not to do something. I'm so glad he pursued his passion and changed the face of music to what we know it as today. Kids (and adults:) will love the lively, upbeat language in this fun, fresh, inspirational story! Wow! What an amazing story! Everyone will appreciate this story of pluck and persistence. Love the way this shows how creative and inventive this is!